When you get a Brazilian keratin hair straightening treatment, your hair will be stronger, straighter and more lush than ever before. But certain types of foods can help keep your hair strong and lush-looking longer. Your hair is naturally made out of protein, just like your nails and even much of your skin. So when you eat foods that are higher in protein, you can reinforce and strengthen the natural proteins found in your hair. Foods that are rich in protein include meats, fish, dairy products and even such vegetarian foods such as beans and nuts. Increase your intake of these types of food and not only will you feel full longer, but you’ll have stronger hair that looks more glamorous. Most women are used to supplementing their iron intake in order to boost their blood. But one of the symptoms of having too little iron in your system — known as anemia — is hair loss. Both your hair follicle and its roots are fed by a rich blood supply that is high in nutrients. When iron levels in the blood fall, anemia is often the result. In addition to taking iron supplements as directed by your doctor, foods that are rich in iron include red meat, poultry, lentils, and leafy green vegetables such as spinach and greens. Most people know that Vitamin C can boost your body’s natural immunity, but did you also know it’s good for your hair? 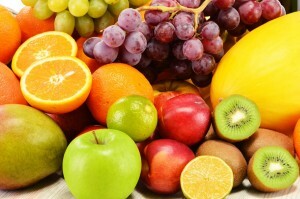 Vitamin C aids in the body’s absorption of iron. So if you are eating foods that are rich in iron, you want to make sure you also are eating foods with a lot of Vitamin C. These include citrus fruits, blueberries, broccoli, and sweet potatoes. When it comes to having strong, vibrant hair, you truly are what you eat!